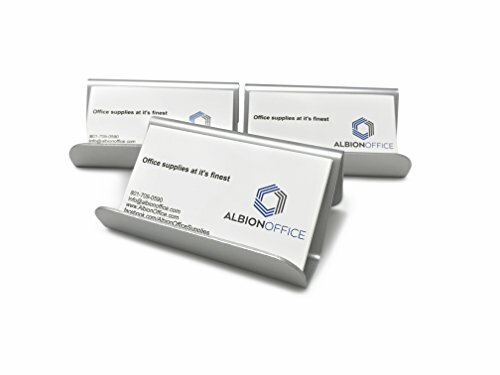 This high end business card holder, made out of solid aluminum, is meticulously made to keep your desk and office looking classy and professional for your clients. Our card holder features an eye catching, sleek brushed metal finish that will surely appeal to all clients. It features an open ended design that will accommodate almost any size or shape of business card of your choosing. Holding up to 50 cards, it provides plenty of room to stock a generous amount of cards while still keeping a clean and organized look for any executive desk. Its slim design with clean lines and sure to make your business card look phenomenal on any desk. Executive class business card holder/stand/case. Made of solid aluminum with a sleek brushed finish. The unique design is perfect for your professional desk. Will hold up to 50 business cards. Open ended design allows for use with business cards of any size. If you have any questions about this product by Albion Office, contact us by completing and submitting the form below. If you are looking for a specif part number, please include it with your message.